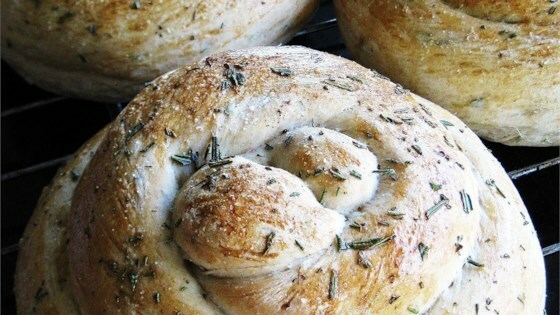 "Crusty, chewy bread ribboned with a savory filling. This is an authentic French recipe." In a large bowl combine the yeast, sugar, 1 teaspoon of the salt and 1 1/2 cups of the flour. In a sauce pan combine the milk, water and 1/4 cup of the butter or margarine until 110 degrees F (38 degrees C). Add milk mixture and vinegar to the flour mixture and blend at low speed of the mixer until moistened. Beat at medium speed for 3 minutes. Stir in 1 1/2 cups additional flour to form a sticky dough. Turn dough out onto a floured surface and knead adding 1/2 to 1 cup more of flour until dough is smooth and pliable. Place dough in a greased bowl and let rise in a warm place until doubled in volume. Punch down dough and roll into a rectangle shape about 16x8 inches. In a saucepan heat the onion, garlic, 1/2 teaspoon salt, parsley and 2 tablespoons butter or margarine until butter or margarine is melted. Spread over the dough rectangle and starting from the 16 inch side roll the dough up tightly like a jelly roll. Place the bread seam side down onto a greased cookie sheet and let rise until doubled in sized. Bake bread until golden brown about 20 to 30 minutes. Brush hot bread with melted butter and sprinkle with chopped parsley. See how to make simple French bread dinner rolls from scratch. I thought the onion flavor was too strong. My husband enjoyed it, but I would change the herbs around a little bit. This bread is a wonderful complement to any meal! The filling in this recipe was too strong. Half a cup of minced onion is way too much. The bread itself tasted okay, but turned out very, VERY dense - not what I expected. Maybe I did something wrong, but this bread did not seem to rise successfully and turned out very dense. However, the flavor was exceptional, and I may attempt to make this bread again.